I don't do a ton of decorating for Christmas, but we do always have a tree and a few other fun things around the house. Below is one of my favorite thrift store finds last spring - a brand new Nutcracker advent calendar, still in the box, for $3.00. 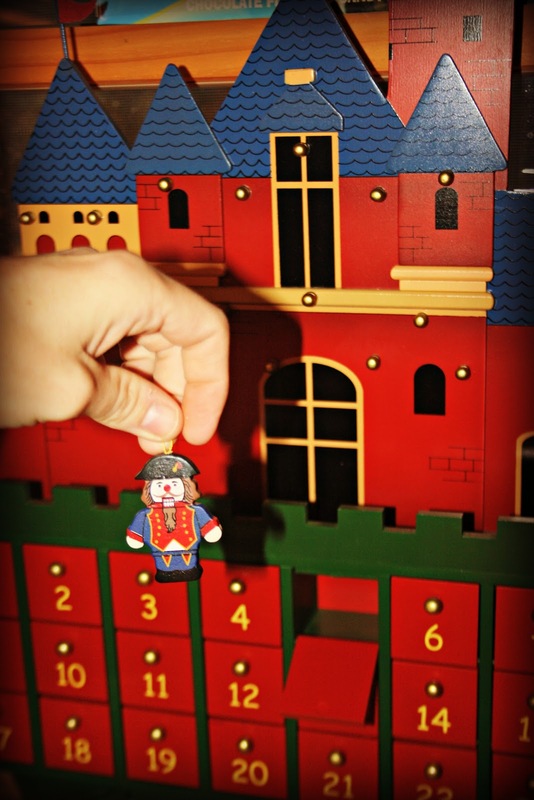 Each day you take a little wooden nutcracker out of the appropriate door, and hang it on the knobs on the castle. 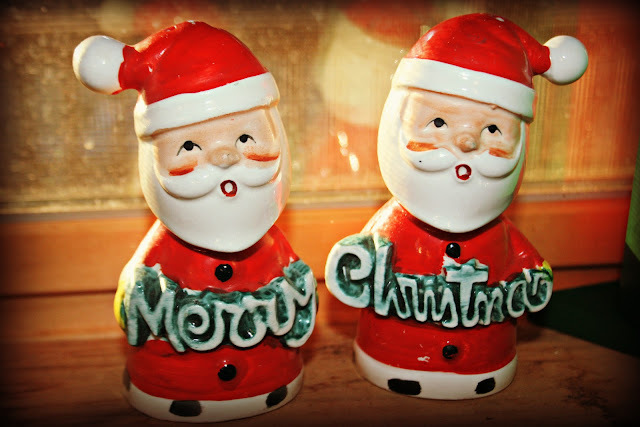 These vintage Santa salt and pepper shakers are from my Granny Anne. They are sitting on my kitchen window sill, and make me smile. Below is an ornament I made from Pierce's first Christmas. He was two months old when I painted the palm of his hand and gently pressed it onto the little wooden disk. Each year when we put up our tree, we always hold his hand up to it, to see how much he has grown. 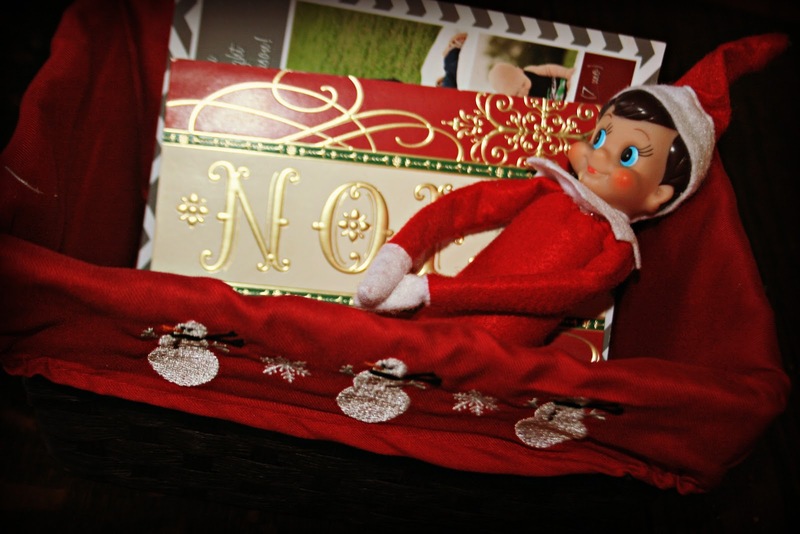 Our elf, Tulley, continues to show up in unexpected places each morning. Today, as I'm writing this, he is towering above me up in the rafters. Not sure how he got so high up. Must be some major Santa magic going on. What do you have up for the holidays, readers? Do you have any favorite decorations in your house? I really like that nutcracker advent calendar and the ornament with Pierce's hand. Both are very cool! I love your Nutcracker house. What a deal! Wow you do find some very cool thrift store finds. I love you Grammas salt and pepper shakers. Your boys always make me smile. Thanks for that. I have nothing. Nothing. Please come do my house for me. John usually does it but he is in Honduras. So I need major elf help. Love all your decorations !!! Wow what a awesome puzzle !!!! I love so much in this post. I love your nutcracker advent and those salt and pepper shakers are so adorable. I love that you put up his hand to the ornament every year, it sort of motivates me to try and do something like that this year. Oh I love to see the decorations and the happy smiles that you have there. And for the decoration I like the calendar marking the days off. what a steal, the advent calendar! i have a felt one that needs some major repairs! my favorite is probably the christmas tree skirt that i started on braden and dalton's first christmas. each year i paint the kids' palms and they leave their handprints..we filled the front side, now had to flip it over. still need to do this years prints. it's been hard getting all the kids in the house at the same time with ashlyn's busy schedule now! i also started a new tradition last year, saw it on pinterest of course. when we get our tree, we have them cute a small portion from the trunk and i let the boys paint it and i date it. i wish i had started that one earlier on! I love your decorations! 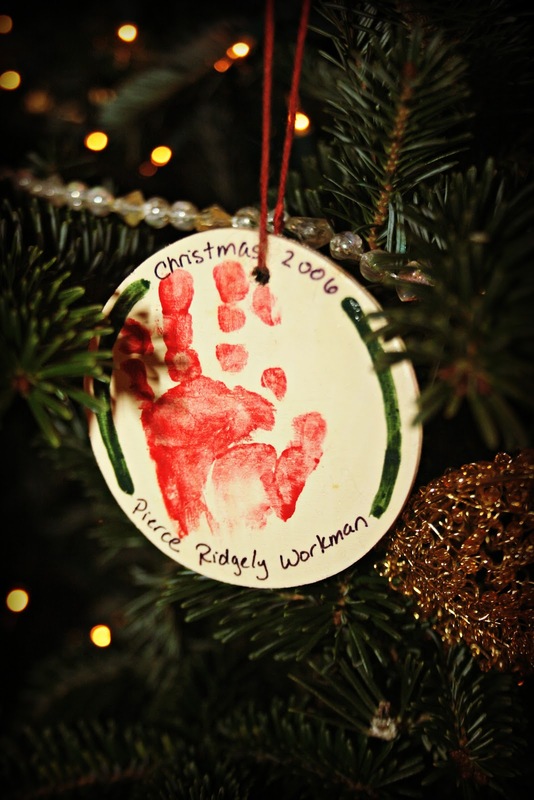 The ornament with Pierce's hand print is just wonderful. And the nativity puzzle is fun looking. We have a big tree and a little tree and a nativity scene and lots of battery-powered candles. I love Pierce's hand ornament. It's precious!! 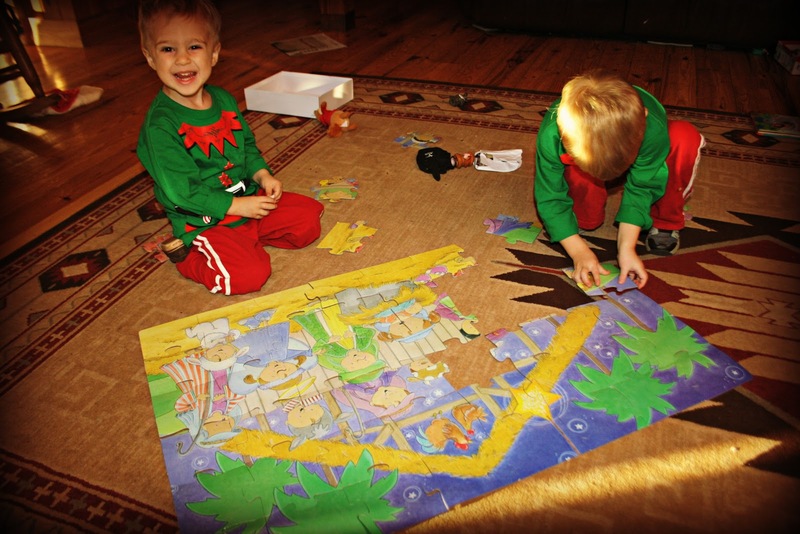 And I love the twins' "teamwork" on the puzzle. We usually have a pre-lit tree (Livie insisted on the multi-color lights, even though I really wanted all white). It has some store-bought ornaments and some that Livie has made. Then we have the stockings hung-up on the mantle. Oh, and I can't forget the "chile-ristra" that's made out of lights that look like red chiles!! I also have a string of multi-color lights that look like chiles, but I didn't hang it up this year. And finally, we have a string of white lights up on our evergreen tree out in the north-east corner of our front yard. No decorations here yet - not into that festive mood - hopefully I"ll get there soon. LOVE that little advent calendar - and My Mom had (maybe still has) those same Salt and Pepper shakers! I love your nutcracker house! Oh what a cute calendar, Lisa. I had a wall hanging for my kids when they were little--where they added one ornament each day to the little Christmas tree.. That way the kids knew how many more days it was 'til Christmas. I love the nutcracker one though. We are enjoying the beach in beautiful Ocean Isle Beach, North Carolina. I will think of you today at 12 minutes and 12 seconds after 12 noon on 12/12/12/.... Unbelievable. i like pierce's little 'paw print'! funny seeing all the teachers out of uniform so to speak! I do hope she didn't get the days mixed up, that would be bad. I think the little salt & pepper shakers are adorable. I decorate mostly with candles & lights. I enjoy the glow they give off. I love the two santas!! I love that decoration you made, with his little palm! I love that huge puzzle!!! And the hand print and the Advent calendar, I have never seen an Advent calendar this cool. We had hoped to put our tree up this year but sadly, were not able to. The cats gnawed on the lights, end of story. So I have a tiny white tree and put our manger scene under it, maybe I will post a picture sometime. It has no lights and the tiny ornaments are glued to it, so it disgusts the cats. That is a neat nutcracker advent calendar. I have a tree up, some candles and a wreath this year thats about it. I don't know if I could pick one decoration because I love all of the items I have but I do treasure a Santa who is ceramic and belonged to my husbands Nana who was born 1900 so I am guessing this Santa is about 70 years old. Love the countdown to Christmas you have, it's very cute. What a cool puzzle for the boys. Love your S&P shakers. I do collect them but haven't bought any this year. I had some salt and pepper shakers kind of like those that I gave to my Daughter. She does a lot more decorating than I do. Your having so much fun- I am coming right over. Lisa: Cort is "consulting" -- for now! I'm sure your home looks gorgeous for Christmas! Cute pictures! I love the little handprint. The nutcracker advent calender is lovely. Only twins can job share like this with their special understanding. We have Nutcrackers, books, one is a puzzle book and a lot of pretty ornaments. I decorate with a lot of red ribbon to. Lovely captures! Wonderful decorations. We generally put up earthen lamps on our balcony during Diwali, our biggest festival. I love Pierce's ornament! Cute pictures!